THE 2016 SAMPARI ART EXHIBITION AND SALE FOR WEST PAPUA in the Australian Catholic University’s Art Gallery in Fitzroy in December 2016, hosted by the Federal Republic of West Papua’s office in Docklands, included a special WALL OF MELANESIAN PRINTS. The vibrant works sent by artists from Solomon Islands, Vanuatu, Fiji, and Papua New Guinea projected kaleidoscopic views of Melanesian West Papua: as carriage of identifying tribal cultures, agents of social change, protector of complex ecologies, children battered by war, as contested political identity at the centre of regional affairs. All the prints were bought during the exhibition. Demand for several was heavy, requiring re-prints. The exhibition is reproduced below, interspersed with excerpts (in italics) from an essay by Sydney arts critic ELLA MUDIE, and with text that traces the renaissance of Melanesian identity in West Papua in the 1980’s, its ride above Indonesia’s scarifying endeavours, its journeying to re-engage Pacific kin, and homecoming in 2015 when the MELANESIAN SPEARHEAD GROUP accepted West Papua’s application for membership. Whether artists can, or should wade into the arena of politics is a vexed question in the world of contemporary art. Within the framework of neoliberal capitalism, debate frequently involves heated discussion over the recuperation of critique and protest. 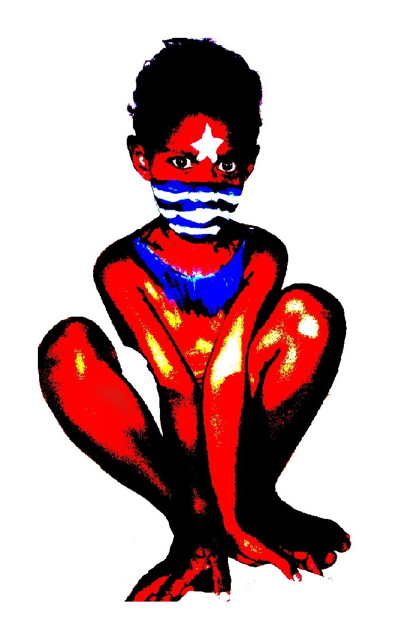 In this environment of passionate disagreement over the role of the artist, the organisation of cultural events like Sampari along lines of solidarity, bringing together a diversity of artistic works in the name of a single cause – freedom for West Papua – provides an important outlet for expressing desire for change at a community level. 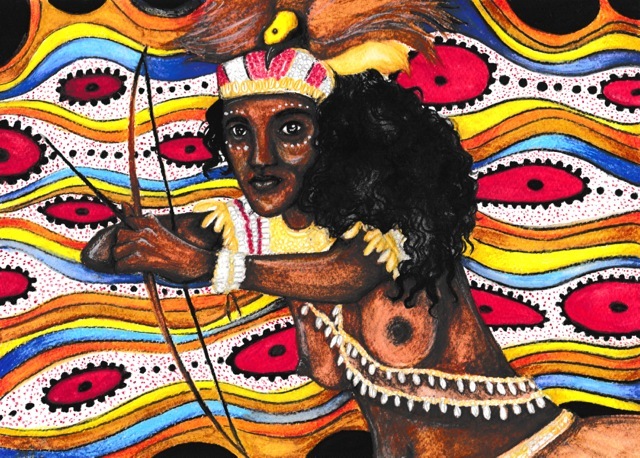 Contributions such as Monica Gunawan’s vivid painting of a Melanesian woman rebuking tribal traditions by raising her bow and arrow to hunt speak to the power of solidarity along gender lines. 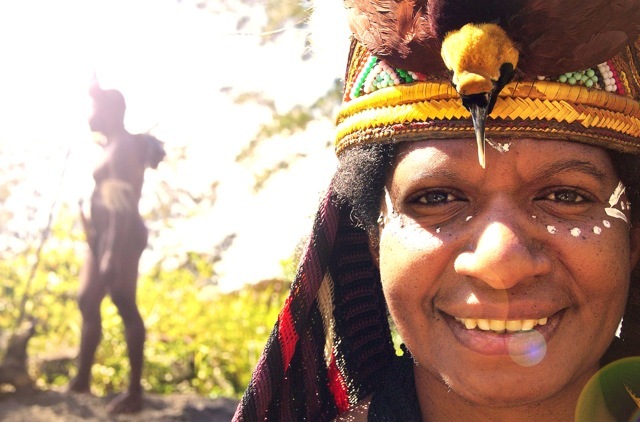 This is especially poignant in ‘Hope’ an empathic portrait of a West Papuan woman in Indigenous headdress by a West Papuan photographer. Solidarity with and between women acts as a subtle mode of resistance as it manifests not only in art but in everyday life, the realm wherein the personal becomes political and grassroots change often begins (ELLA MUDIE). The Melanesian states were colonies when the United Nations gifted West Papua to Indonesia in 1962, and may have been unaware of the theft of 416,000 sq kms of Melanesian land and consequent slide of the Indonesian border from Meridan 139E to Meridian 141E (Note 2). A raft of name changes in West Papua helped mask the crime. Nederlands Nieuw Guinia became Irian Barat (then Irian Jaya), Hollandia became Jayapura (victorious city), Mount Carstenz overlooking what would be the (US) Freeport gold-and-copper mine became Puncak Jaya (victorious mountain), Dirk Hartog Island became Pulau Yos Sudarso after an Indonesian Navy commander. Little news escaped from the territory now categorised an Operational War Zone. Journalists and academics were denied visas. Subversion laws were exacted by a judiciary ruled by the military (which four years later slaughtered three million of its own citizens in Java and Bali). Only the ni-Vanuatu, urged on by their first prime minister Walter Lini, remembered the orphaned Papuans. Craft work is often characterised as apolitical in the discourse of western art. Yet the exchange of art and craft objects in regions like Melanesia have long been implicated in complex political and social relations. 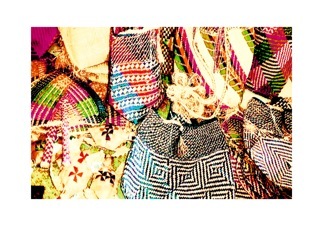 The inclusion of fibre arts in Sampari’s Melanesian wall of art, specifically the bags of the Tongoa-Shepherds Women’s Association in Vanuatu, are reminders of how the production and exchange of objects forge points of connection between Melanesian cultures. For writers such as the late Epeli Hau‘ofa, recognising such connections provides a politically transformative corrective to the notion that Island cultures are somehow separated and isolated by the sea, pointing to how Pacific Islanders belong, rather, to an oceanic community based on voyaging. West Papua’s assertion as a Melanesian state on 14 December 1988 was the initiative of Dr Thomas Wainggai, a senior public servant in Indonesia’s provincial administration with a law degree from Japan’s Okayama University and a PhD in Public Administration from Florida State University. Wainggai’s studies outside his homeland convinced him that West Papuans needed to resist the Indonesian occupation through dialogue-based negotiation generated by ‘justice, peace and love’ and to develop a national political structure based on their cultures, geographies and histories. 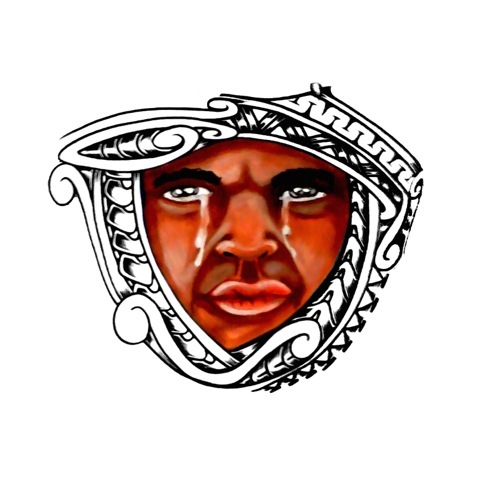 He raised a flag in the name of WEST MELANESIA on 14 December 1988 and was immediately arrested and incarcerated. Twelve months later eighty-eight academics from Cenderawasih University who had been developing and implementing the non-violent paradigm were also arrested and incarcerated. However the seeds of a resistance and nation-making endeavour that looked to the east more than the west had already been cast and taken root. Melanesians feel something that anthropologists call ’embodied kinship’ when they hear about West Papua. 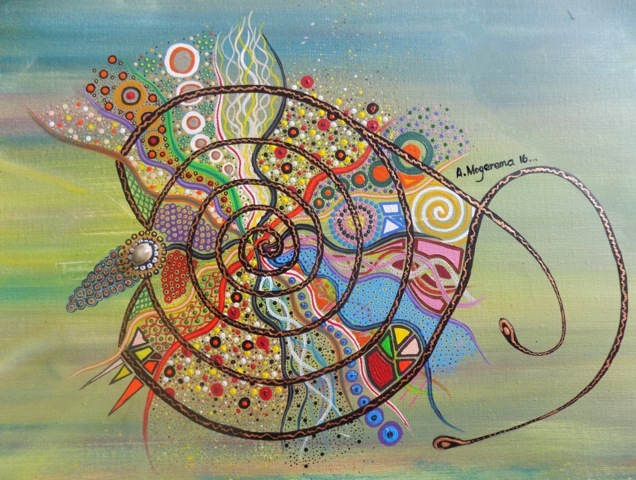 KINSHIP RECOGNITION enacts long-established, reassuring, interconnecting patterns that are crucial to a human being’s sense of identity and security …. recalling a common history of origin and journeying across time and space, which in correlation with genetics, produces striking and inherently meaningful similarities. The Netherlands colonial administration was sensitive to this and provided for Papuan pastors to participate in Protestant church conferences in the Pacific and students to study at the Fiji campus of the University of South Pacific. After the establishment of the South Pacific Commission in 1947 (where the independence of the colonies was assumed even if discussion was curtailed to economic and social welfare) it sent Markus Kaisepo, a prominent bureaucrat from Biak-Numfoor, to the first meeting of the Commission’s indigenous leaders—an historic gathering in 1951 described by the Governor of Fiji (Sir Brian Freeston) as a Parliament of the South Pacific Peoples. The Unitary Republic of Indonesia severed these rich veins of continuity and solidarity on 1 May 1963. West Papuans lobbied the Melanesian Spearhead Group (MSG) for fifteen years before the inter-government forum accepted their application to join in 2015. Papuans multiple nation-making processes, as much as Indonesia’s bribes and blocking tactics, retarded the project. However, during an intense week-long Reconciliation and Unity Summit for West Papuan Leaders in Vanuatu in 2014 a United Liberation Movement for West Papua (ULMWP) was elected from, and rendered accountable to, West Papua’s three key independence identities: Secretary-General Octo Mote and Executive Officer Jacob Rumbiak from Federal Republic of West Papua, Spokesman Benny Wenda from West Papua National Parliament; Leonie Tanggahma and Rex Rumakiek from West Papua National Coalition for Liberation. The historic summit was generated by church and women’s organisations across Melanesia; sparked by the 2013 World Council of Churches Assembly in South Korea; supported by West Papua’s Gereja Kristen Injili (GKI) Church; sponsored by the Vanuatu Government and Pacific Conference of Churches; and mediated by the Vanuatu Christian Council and Malvatumauri National Council of Chiefs. 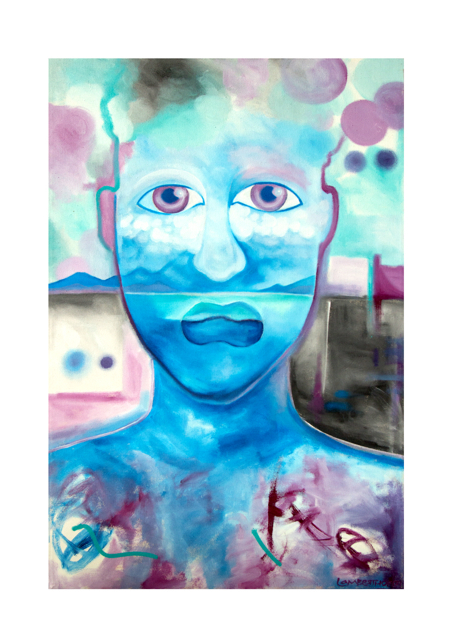 MARTIN LANCE (Papua New Guinea) FREEDOM “I tried to illustrate the hearts and minds of three great freedom fighters and leaders. Nelson Mandela and Martin Luther King are smiling because they have freed their people, but Benny Wenda’s heart and mind are troubled because he is still struggling for freedom. The future of the next generation, the killing of innocent people and the hope of West Papua’s independence weigh heavily on the freedom fighter in the corner. A widow with amputated fingers symbolizes the women’s pain, even if her child is still showing courage for freedom. Solidarity is a powerfully loaded term. Deriving from nineteenth-century French, the word describes a “unity or agreement of feeling or action, especially among individuals with a common interest.” It is a notion that stirs, binds, and resonates most strongly during moments or events of crisis. Since taking temporary control of West Papua in 1963, and following the consolidation of its unlawful rule through the UN-sanctioned and now discredited Act of Free Choice 1969 ballot, Indonesia’s brutal occupation of West Papua has been responded to with complex lines of solidarity and resistance, as well as complicity, among the diverse nations and cultures of the Asia-Pacific region. 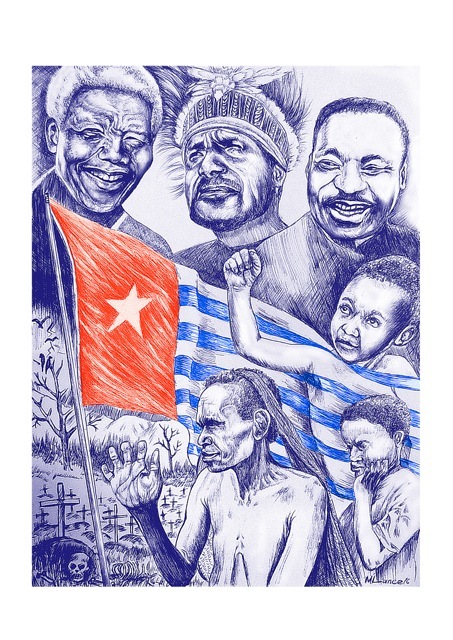 Humour and satire is another means through which solidarity is expressed as in Campion Ohasio’s cartoon ‘Heroes or Traitors of West Papua’. First published in the Solomon Islands newspaper The Island Sun in 2015 on the day the leaders of the Melanesian Spearhead Group met in Honiara to vote on West Papua’s membership, Ohasio’s drawing depicts a man flailing in the sea. 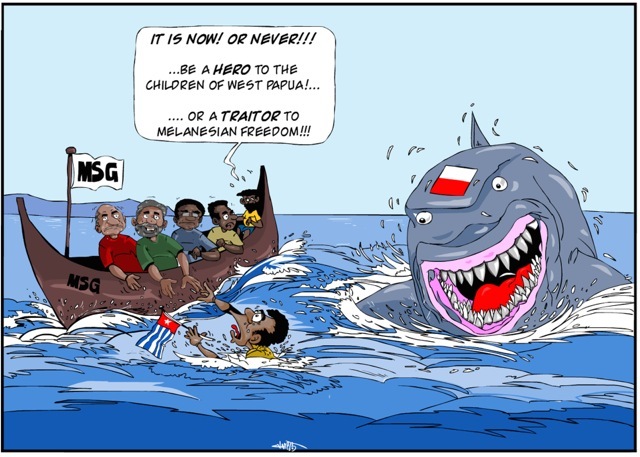 With the West Papua morning star flag in one hand, he reaches out to the MSG leaders seated in a canoe to raise him from the clutches of the great white shark of Indonesia. This liberty to express a strong point of view through satirical humour without threat or fear of retribution, no matter how provocative the message, is one of the hallmarks of a free society and a point of solidarity that unites artists across cultures. That West Papua’s right to independence and self-determination was recognised by the Melanesian Spearhead Group in 2015 can be attributed to a coalition of political, religious, academic and civic leaders from the Solomon Islands, a tiny archipelago of half-a-million Melanesians (Note 3). Prime Minister (and MSG Chair) Manessah Sogavare, assisted by Peter Forau (Director-General, MSG Secretariat 2011-2015) and Emele Duituturaga (Director, Pacific Islands Association of Non-Government Organizations), leap-frogged the MSG’s more compromised states (Papua New Guinea and Fiji) with the support of Polynesian and Micronesian leaders from the Pacific Islands Forum (Note 4). As the Pacific Coalition for West Papua based in Hawai’i University and advised by Solomon Island Professor Tarcicius Kabutaulaka, they lobbied the 2016 United Nations General Assembly to reinsert West Papua on the UN Decolonisation List—from which it was removed in 1969 after the New York Agreement’s fraudulent Act of Free Choice (Note 5). Today, Indonesia continues to solicit geopolitical support for its territorial claim to West Papua with its charge of non-interference and the assertion that the sovereignty of nations should be respected. Citing the national interest, the Australian government turns a blind eye to the Indonesian military’s violations of human rights in the name of unwavering solidarity with its regional ally. 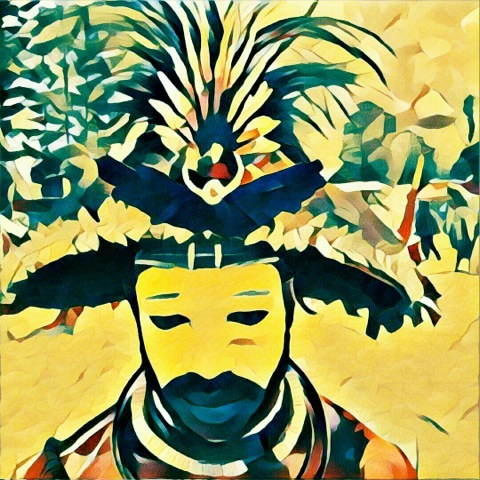 However, the feeling of solidarity that events like the Sampari Art Exhibition convey for West Papuans reveal that beneath the official rhetoric of governments that nothing can be done, there simmers a deep sympathy and passionate desire for justice among ordinary citizens that seeks an outlet in real and meaningful action. “My father’s a painter so I grew up with art and the smell of oils. First and foremost though I’ve always been a big reader, which led me to enrol in a BA at the University of Sydney where I majored in English and wrote an honours thesis on the maverick boy poet and hoaxer Thomas Chatterton. 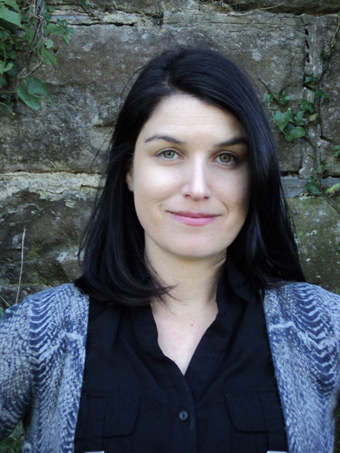 I also took some postgraduate studies in journalism and found my niche in print features and arts writing, leading to features for The Age and other newspapers, and articles and essays in magazines and journals including Meanjin and the Griffith Review (http://www.ellamudie.com/). 2. MERIDIAN 139 cuts through the Ceram Sea on the west coast of Misool Island (one of the four major islands of West Papua’s Raja Ampat Island Group). 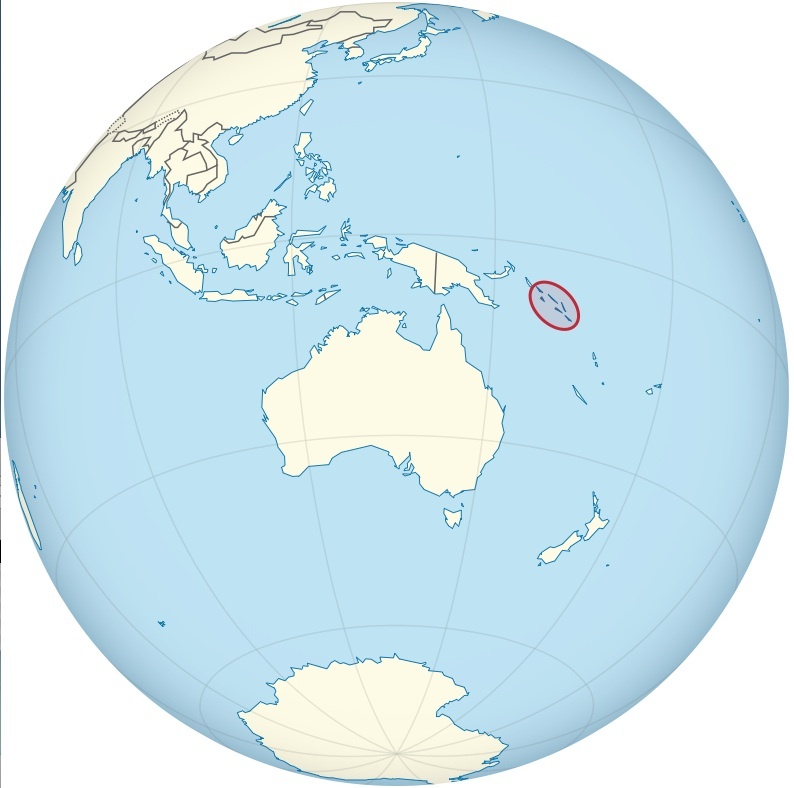 MERIDIAN 141 divides the island of New Guinea. For more see Frank Jacobs, author of Strange Maps: An Atlas of Cartographic Curiosities, in ‘Who bit my border?’ New York Times, 13 March 2012 [https://opinionator.blogs.nytimes.com/2012/03/13/who-bit-my-border/?_r=0]. 3. The Melanesian Spearhead Group was formed in July 1986 during a meeting of Heads of Government of Papua New Guinea, Solomon Islands, Vanuatu, as well as the Kanak Socialist National Liberation Front (FLNKS), who agreed to work together in spearheading regional issues including the Kanak’s struggle in New Caledonia for independence from France. On 14 March 1988, PNG Prime Minister Paias Wingti, Vanuatu Prime Minister Walter Lini, and Solomon Islands Foreign Affairs Minister Ezekiel Alebua signed the ‘Principles of Cooperation Among the Independent States in Melanesia’. FLNKS formally joined the MSG in 1989. Fiji joined in 1996. The MSG’s Secretariat’s office in Port Vila, constructed by People’s Republic of China, opened on 30 May 2008. 4. The Pacific Islands Forum is a political grouping of fourteen Melanesian, Micronesian and Polynesian independent and self-governing states, as well as Australia and New Zealand (that is, Solomon Islands, Vanuatu, Papua New Guinea, Fiji; Federated States of Micronesia, Republic of Marshall Islands, Kiribati, Palau, Nauru; Cook Islands, Tonga, Tuvalu, Niue, Samoa). In 2015 the Forum accepted West Papua’s application for membership subject to a PIF Fact-finding Mission to West Papua, which Indonesia subsequently rejected. 5. Speakers to the 2016 UNGA were Prime Minister Sogavare (Solomon Islands) Prime Minister Salawi (Vanuatu) Prime Minister Pohiva (Tonga) President Hilda Heine (Federated States of Micronesia) Prime Minister Sopoaga (Tuvalu) President Divavesi Waqa (Nauru) Dr Caleb Otto (UN Representative, Republic of Palau).